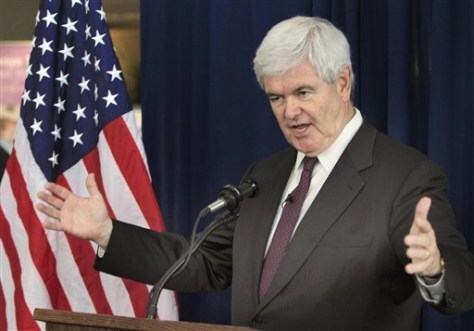 >>> one day after his presidential campaign imploded, newt gingrich vowed to carry on. >> i had a candidate for the united states , because i think we are in the early stages of the obama depression. 14 million americans out of work. there are 1 in every 4 american families has a mortgage that is more expensive than the house is worth. >> nbc's david gregory , moderator of "meet the press, quats joins me more in a busy week in politics. you there reset button pushed there in this case, and reporters poring through the e-mails of sarah palin . where does this leave the republicans? >> unsettled. you have sarah palin treated lie a presidential candidate , and she's not. they're going after her time as a governor, and a time as a candidate, and at the time, she's a common tartd and a political figure in her own right, and we'll see if that changes. we're finding not a lot of bombshells. irritation with the media, and working through the rigors of being an office holder ooze a governor. might we have learned this on the vice presidency , but more insight into how she operates. to the point of language, very interesting that he's still in it, but all of the attention is all the wrong kind of attention. the campaign, a lot of backstabbing going on against his wife, melissa, saying she had an iron fisted grip on the schedule. with this backfighting going on in the campaign, this isn't good. >> we reached the end of the week. congressman anthony weiner has survived so far. how does that bid for his survival? >> that's status quo, but the leaders of the house, nancy pelosi , who is quite upset with how this haspenned. but nevertheless said publicly it's up to his constituents whether he should resign or not, and he's looking at a poll right now that shows majority support for his lead.